Extend your dining table and create a space large enough for all to gather or take leaves out when you want to create a smaller, more intimate dining space. Add leaves to create a table that can be large enough to accommodate a large dinner party or your growing family. By adding or subtracting table leaves you can have a piece that fits your needs and changes up the look of your dining room effortlessly. 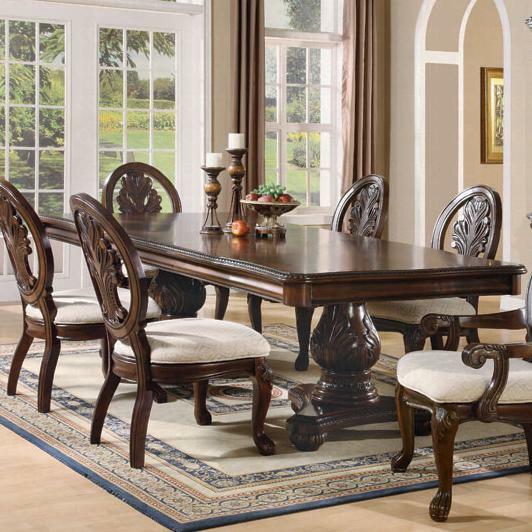 Gather around the traditional style of the rectangular double pedestal dining table, with its sculpted legs and edging. Add the dining side and arm chairs for a complete dining set. The Tabitha Traditional Rectangular Double Pedestal Dining Table by Coaster at Del Sol Furniture in the Phoenix, Glendale, Tempe, Scottsdale, Avondale, Peoria, Goodyear, Litchfield, Arizona area. Product availability may vary. Contact us for the most current availability on this product. 101037B2 Rectangular Dining Table Box 2 1 0" 0" 0"
101037B1 Rectangular Dining Table Box 1 1 0" 0" 0"
Finish Set in a Cherry finish. Handles & Hardware Brushed metal hardware. 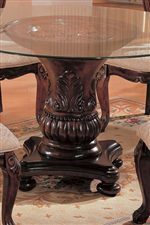 Case Detail Intricate carvings in table edges, cabriole legs, and pedestal bases. Description: Top Glass and wooden table tops. Turn back time with the glorious design of the Tabitha dining collection. Rich birch solids and veneers are set in a Cherry finish. A traditional style comes alive with intricate carvings, sculpted bases and legs, comfortable upholstered seat cushions and brushed metal hardware. 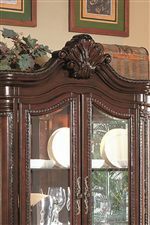 Find the right look for your home with the dining arm and side chairs, rectangular dining table, round glass top dining table, buffet, hutch and complete china cabinet. The Tabitha collection is a great option if you are looking for Traditional furniture in the Phoenix, Glendale, Tempe, Scottsdale, Avondale, Peoria, Goodyear, Litchfield, Arizona area. Browse other items in the Tabitha collection from Del Sol Furniture in the Phoenix, Glendale, Tempe, Scottsdale, Avondale, Peoria, Goodyear, Litchfield, Arizona area.